Dr. Russell T. Richardson was born and raised in Texas, and graduated from Texan Christian University with a BA in business and a minor in Spanish. He also attended Florida State University for his advanced science studies before attending the University Of Florida College Of Dentistry where he received his DMD degree. 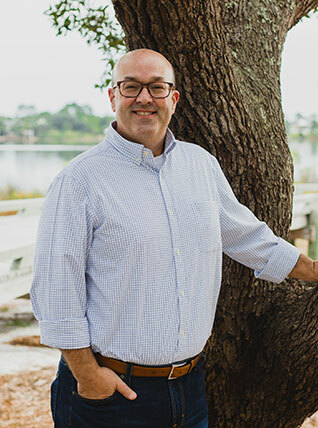 Dr. Richardson is a member of numerous dental and community groups such as the American Dental Association, Florida Dental Association, Bay County Dental Association, the Chamber of Commerce, and the United Methodist Med’s Club. Dr. Richardson and his family are members of the Point Washington United Methodist Church. Dr. Richardson volunteers extensively in community dental programs such as the Children’s Volunteer Health Network, for which his serves on the board of directors, and Give Kids a Smile. Dr. Richardson married his wife Michelle in 1999 and they have two beautiful daughters, Lilly and Ava.